“In general the close connection between advertising and the cosmic awaits analysis” wrote Benjamin (Arcades, 175). Indeed, and the connection would only become closer in the 50s; when, meanwhile, the phalanstery was finally conquered for the suburbs. Is it? 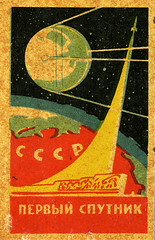 These Soviet space program matchboxes (linked to by owen) suggest not.